The book is easy to read and very informative. Divided in two parts; the first part focuses on explaining what are the common components of toiletries and cosmetics we use such as preservatives, colour pigments, detergents, moisturizers and fragrances. The second part then lists out products more specifically, such as makeup, skin care, hair care and so on. This book actually made me pause and reconsider my beauty regime (which has been non-existent for the past few months). It comes as no surprise that most of our beauty products are loaded with chemicals, in fact they are made from chemicals. While chemicals themselves are not bad, what the beauty industry hardly clarifies is how much of each chemical is used (largely to keep their formulas secret) and the risk posed by some of the key components. What I love about the book is some nifty tips it gives to help replace some of the toxins in our daily regime. I will share some of them below. How natural is natural – a lot of beauty products claim to contain all natural ingredients; however the natural ingredients are often a small component of the product which also contains a lot of other preservative chemicals. Moral of the story, don’t buy something simply because it claims to be natural. The necessary evils – some products we simply cannot do without, such as shampoo, hair styling products (as a curly haired girl I swear by mousse) in such a case we either use lesser quantities of these or reserve these products for special occasions. I am already keeping my hair mousse aside only for the party season. Avoid the hype and marketing- This looks rather obvious, but is actually not. Do we really believe that a shampoo for 100 rupees is going to contain egg yolks and give us healthier hair. Probably not. But walk into a fancy shop, see the window display and pushy SA’s and you know you will buy it. 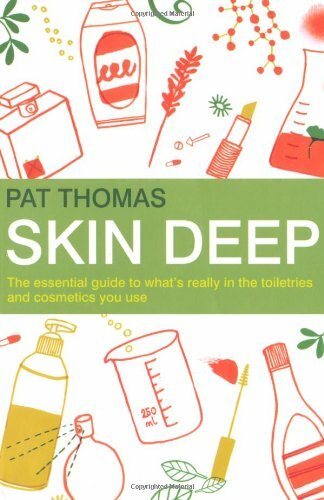 The book mentions a survey which revealed that most women in UK had not used or rarely used 42% of the toiletries they purchased. Imagine the ecological impact of it all. So buy what you need and splurge occasionally. Don’t underestimate DIY – a lot of fancy products can be made in your own kitchen, it takes some effort and time, but it’s a good start. Read the label – Read it not only for the ingredients, but also for claims such as ‘dermatologist tested’, ‘hypoallergenic’ and try investigating what the company means. The product is dermatologist tested, but what were the test results, how many of the research subjects end up with a reaction, do we really know the answer to that. So here are some tips mentioned in the book that might help. Sunscreen- we all know it is important to wear sunscreen, but do we know that the key component of it is zinc oxide (calamine) or titanium dioxide which causes a whitish cast. A lot of fancy sunscreens use nano particles of the same so that we don’t end up with the whitish face. The problem arises when the nano particle is easily absorbed by the skin, and sunscreens also contribute to skin cancer. Moral of the story, do apply your sunscreen but do not slather it on, and don’t keep applying it again and again. Everything nano is not necessarily better. Use soap – yes you read that right. Soap being a dry bar, contains lesser chemicals than facewashes and body washes. Just use your basic soap and follow up with some face oil or if you plan to step out then moisturizer. All in all, I strongly recommend this book. We cannot give up everything we use, and the book doesn’t ask us to, it only tells us what each product contains, how to read labels and cut through the hype. In case any one feels like switching to a simpler beauty regime, the book also tells us how to do so. I think the book opens up a lot of debates and is a must read. Till you get your hands on the book, I found some articles along similar lines , see them here and here. And here is a campaign for safer cosmetics, good resource to see which cosmetic giants are trying to clean up their act.